Also serving communities of Shell Rock, Fredericksburg, Dumont. There are 3 Assisted Living Facilities in the Waverly area, with 2 in Waverly and 1 nearby. To help you with your search, browse the 1 review below for assisted living facilities in Waverly. On average, consumers rate assisted living in Waverly 5.0 out of 5 stars. Caring.com has helped thousands of families find high-quality senior care. To speak with one of our Family Advisors about assisted living options and costs in Waverly, call (855) 863-8283. Located along the Cedar River in Iowa, the city of Waverly takes pride in its revitalized downtown area, which is a designated Main Street Iowa District. Seniors looking for assistance with daily activities while enjoying life in one of Iowa’s historic destinations can choose from two assisted living facilities within Waverly and another one nearby. These communities are officially called Assisted Living Programs and are licensed by the Health Facilities Division of the Iowa Department of Inspections and Appeals. The Waverly area is home to world-class medical facilities, including the Waverly Health Center, in the event of medical emergencies or illness. In Iowa, Social Security income is exempt from income tax, providing financial relief for Waverly seniors. Reasonable savings are also realized from retirement account withdrawals and private and public pension income, which are only partially taxed. Waverly has an array of community resources for seniors, including the Waverly Senior Center, a facility that serves as a community focal point for residents 55 and above. It offers a wide variety of activities and programs that promote the well-being of seniors. On a scale of 1 (low crime) to 100 (high crime), Waverly’s property crime rate at 23 is well below the U.S. average of 38.1 and Iowa’s 28.7. However, this is negated by a higher violent crime rate of 44.4, far above the national average of 31.1 and the state’s 25.2. Waverly enjoys generally comfortable summer months with the average high temperature of 83 degrees rising just slightly above the comfort range of 70 to 80 degrees. The winter months may provide some level of discomfort to fragile seniors with little tolerance for chilly weather as the average low temperature is a freezing 7 degrees. Compared to the national average of 100 and Iowa’s 118, healthcare cost in Waverly is relatively more expensive at 122, taking up a large percentage of seniors’ budgets. This is compensated by lower grocery (90), housing (87) and transportation (69) costs, bringing down the city’s overall cost of living to 92. Assisted Living costs in Waverly start around $0 per month on average, while the nationwide average cost of assisted living is $4,000 per month, according to the latest figures from Genworth’s Cost of Care Survey. It’s important to note that assisted living rates in Waverly and the surrounding suburbs can vary widely based on factors such as location, the level of care needed, apartment size and the types of amenities offered at each community. 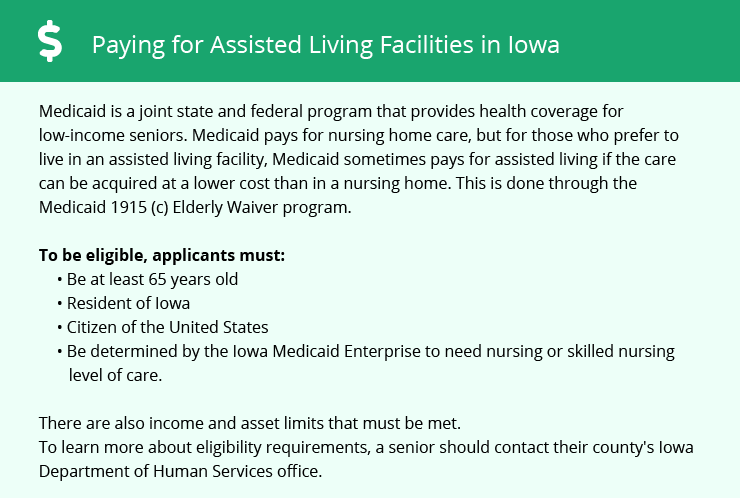 Iowa implements the Medicaid Home and Community Based Services Elderly Waiver under the Department of Human Services. Eligible Waverly members are granted individualized comprehensive plans consisting of services identified by an interdisciplinary team and delivered in community-based settings. Waverly and the surrounding area are home to numerous government agencies and non-profit organizations offering help for seniors searching for or currently residing in an assisted living community. These organizations can also provide assistance in a number of other eldercare services such as geriatric care management, elder law advice, estate planning, finding home care and health and wellness programs. To see a list of free assisted living resources in Waverly, please visit our Assisted Living in Iowa page. Waverly-area assisted living communities must adhere to the comprehensive set of state laws and regulations that all assisted living communities in Iowa are required to follow. Visit our Assisted Living in Iowa page for more information about these laws.